To get the best confetti shots, the most important thing is to make sure you have plenty of it! Ideally you want enough for guests to have a couple of fistfuls each - the more the better! My personal preference is large, colourful confetti made from biodegradable paper. It looks amazing in photos and is light so it won’t hurt your face if guests get overly enthusiastic throwing it! You can buy this from loads of online shops and can either pick colours to match your theme or chose full on multi-coloured. You could also make it yourself using shaped paper punches on tissue paper if you fancy getting crafty! Petals do look beautiful though, and my wonderful couple below - Sophie + Mat - worked out that 15g per guest is the perfect amount (thanks guys!). Again, you can buy this online in a vast array of colours or you can make it yourself, like Alice’s mum did (below), drying out petals from her garden for over a year! (super mum!). Traditionally, confetti was thrown as couples walked out of the church. These days, we can be a bit more flexible! 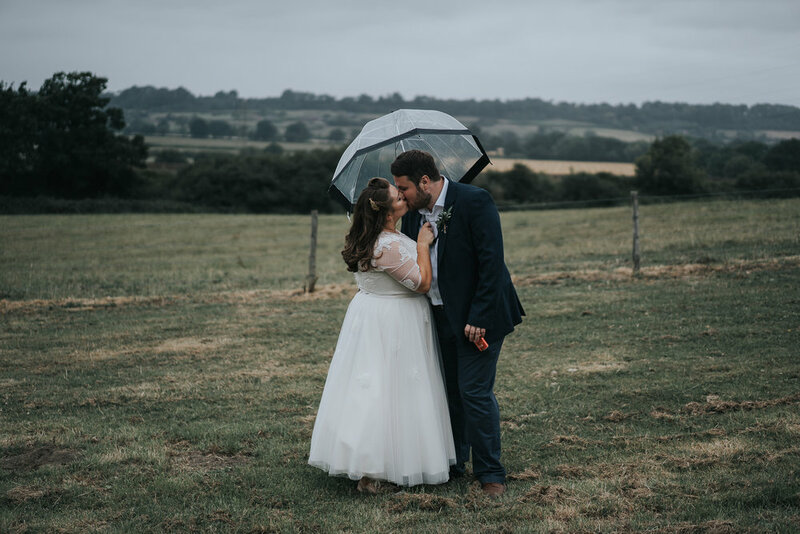 You’ll want to check if your venue has any rules (they may also stipulate what type to use as well) and work with your photographer to agree the best time/location on your day. Getting a couple of your wedding party to help with distributing confetti around your guests is also mega helpful. You’ve got your confetti, you’ve agreed a time and place, so let’s do this thing! Hold your head up and smile! 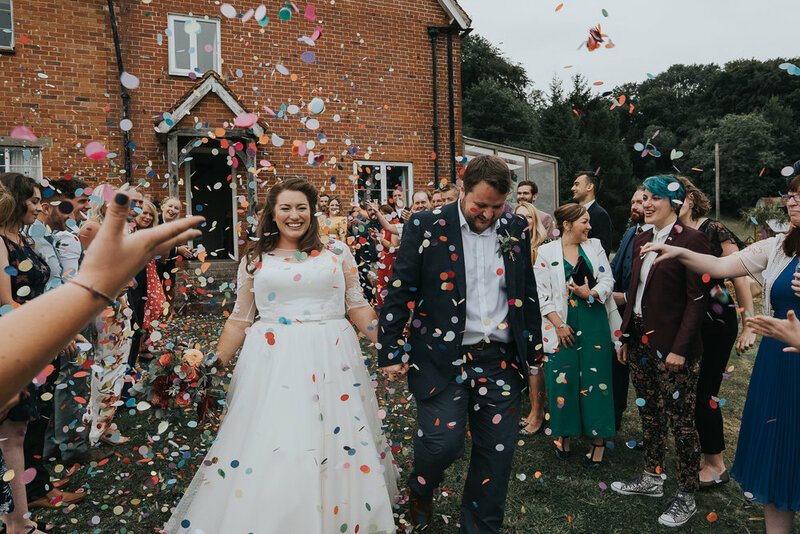 If you’re looking for a Manchester wedding photographer who loves confetti, please get in touch! This is the most important. There’s literally nothing you can do to change it, so worrying or stressing about it won’t help things at all. In the lead up to your wedding, if the weather report is predicting rain, order lots of umbrellas and get yourself some wellies just in case and if you’re having an outside ceremony or reception, check with your venue about a potential Plan B.
I love how the colourful umbrellas pop against the cloudy backdrop! Cloudy skies make beautiful backdrops for photos and they also produce a lovely even light that’s wonderful and flattering to shoot in. Super sunny weddings can actually be much more flattering than grey and drizzly ones! I’m more than happy to go outside and get some romantic, rainy photos if you are! Grab an umbrella and we’ll go find a shaded spot under some trees, or if you're up for it shoot out in the rain. Your outfit may get a bit grubby at the bottom, but your photos will be so worth it! If you’d rather not get damp and you’re flexible with when we can do your portraits, we can either wait for a break in the rain or I’ll find some indoor locations as a backup with lots of natural light to work with. Romantic rainy smooch under an umbrella. And Tony brought his gin with him…what a lad! If it’s looking like there’ll be no break in the rain, I’ll find an indoor location to shoot family group shots and will have the necessary lighting equipment to do so. My preference is always to make the most of natural light, and if possible the great outdoors, so I’ll only shoot the group shots indoors if this is not possible. For your wedding party, if they’re up for it, we’ll brave the rain anyway! Alice + her maids were not afraid of a bit of rain! If you’re looking for a Manchester based photographer who loves to shoot in any weather, please get in touch!